During his childhood, Kishimoto showed interest in drawing characters from the anime shows he watched, such as Dr. Slump‘s Arale and Doraemon‘s titular protagonist. In elementary school, Kishimoto started watching the Kinnikuman and Dragon Ball anime alongside his brother. During the following years, Kishimoto started idolising Dragon Ball‘s author Akira Toriyama, enjoying not only his series Dragon Ball andDr. Slump, but also Dragon Quest, a role-playing video game for which Toriyama was art designer. While he could not afford to buy Weekly Shōnen Jump where the Dragon Ball manga was published, he followed the series thanks to a friend from school who had subscribed to the magazine. By high school, Kishimoto started losing interest in manga as he started playing baseball and basketball, sports he practised at his school. However, upon seeing a poster for the animated film Akira, Kishimoto became fascinated with the way the illustration was made and wished to imitate the series’ creator Katsuhiro Otomo‘s style. During his last years of school, Kishimoto spent time drawing manga and went to an art college with hopes that he would become a manga artist. 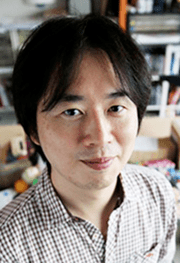 Upon entering college, Kishimoto decided he should try creating aChanbara manga since Weekly Shōnen Jump had not published a title from that genre. However, during the same years, Kishimoto started reading Hiroaki Samura‘s Blade of the Immortal and Nobuhiro Watsuki‘sRurouni Kenshin which used such genre. Kishimoto recalls having never been surprised by manga ever since reading Akira and found that he still was not able to compete against them. In his second year of college, Kishimoto started drawing manga for magazine contests. However, he noted that his works were similar toseinen manga, aimed towards a young adult demographic, rather than the shōnen manga read by children. Wishing to write a manga for Shōnen Jump that targets a young demographic, Kishimoto found his style unsuitable for the magazine. He later met Tetsuya Nishio, designer from the anime adaptation of the manga Ninku who he deemed as a big influence. Kishimoto’s first successful manga pilot was Karakuri (カラクリ, lit. “Mechanism”), which he submitted toShueisha in 1995. This earned him an honourable mention in Shueisha’s monthly “Hop Step Award” in 1996, granted to promising rookie manga artists. At this point he was assigned an editor, Kosuke Yahagi, and worked on a number of rejected drafts including a slice-of-life manga, Michikusa (道くさ, lit. “Wandering Detour”), and an action manga, Asian Punk (アジアンパンク, Ajian Panku). In 1997 he wrote a one-shot version of Naruto which was published in Akamaru Jump Summer and was well received, but proved difficult to rework into a continuing series. In December 1997, while redeveloping Karakuri for serialisation, Kishimoto was offered a one-shot in Weekly Shōnen Jump. Hampered by the sudden deadline, a reworked Karakuri debuted two weeks later in Weekly Shōnen Jump 1998 No. 4-5, but performed poorly in reader surveys and was immediately cancelled. Following the failure of Karakuri, Kishimoto reduced his output and began moving in a seinen direction with drafts for a baseball manga, Yakyūō (野球王, lit. “Baseball King”), and a mafia manga, Mario (マリオ), hoping to find better luck with a seinen magazine. Yahagi persuaded him to give the shōnen genre one last shot and Kishimoto began working on storyboards for a fantasy one-shot, Magic Mushroom (マジックマッシュルーム,Majikku Masshurūmu), but stopped when Yahagi called and asked him to instead develop storyboards for serialisation. The two decided to submit a version of Naruto with a reworked story and world and produced storyboards for the first three chapters, winning a spot in the magazine. With a six-month lead time, Kishimoto repeatedly revised and redrew the first several chapters of the series. Two of his former assistants, Osamu Kajisa (Tattoo Hearts) and Yuuichi Itakura (Hand’s), have gone on to moderate success following their work on Naruto. In 2009, Kishimoto designed an extra costume for the video game character Lars Alexandersson for Tekken 6; in 2010 this character appeared in Naruto Shippuden: Ultimate Ninja Storm 2 as part of a special cross-promotion. In 2010, Kishimoto produced a one-shot baseball manga, Bench (ベンチ, Benchi), as part of Jump’s “Top of the Super Legend” project, a series of six one-shot manga by famed Weekly Shōnen Jump artists. For the ninth Naruto film, Road to Ninja: Naruto the Movie, Kishimoto was responsible for both the story and characters’ designs. To promote the film, Kishimoto worked in Motion Comic Naruto a DVD that shows scenes from the manga in 3D that was given to the first 1.5 million people who went to the cinema. Regarding Naruto‘s publication Kishimoto told Tetsuya Nishio in July 2012 that the series would take over a year and a half to end. However, Kishimoto admitted that it now appears that the manga will continue beyond that timeframe. In April, 2012, it was announced that Kishimoto would publish a one-shot version of his long-postponed mafia manga, Mario, in Jump Square, based on the rough, 160-page manuscript he began working on before Naruto became serialised. Throughout 2013, several of Kishimoto’s one-shots saw their English-language debut in issues of the Weekly Shonen Jump digital magazine, including Mario, Bench, and the original Naruto pilot. Kishimoto was also the winner of “Rookie of the Year” for the series in the Agency for Cultural Affairs. On 10 November 2014, Kishimoto ended the 15-year run of Naruto. By the end of the publication, Naruto had spanned 72 volumes and (as of September 2014) generated global sales of 200 million copies. While as a child Kishimoto enjoyed reading manga, he was inspired to write one after seeing a promotional image for the film Akira. This made him analyse the artwork of Akira‘s original author, Katsuhiro Otomo, as well as Akira Toriyama, another artist he admired. Realising both had their own style regarding the designs, Kishimoto decided to draw manga while crafting his own images. While attending art school, Kishimoto was also an avid reader of Hiroaki Samura‘s Blade of the Immortal, and extensively studied Samura’s page layouts, action sequences, and anatomical techniques. When Kishimoto was originally creating the Narutoseries, he looked to other shōnen manga for influences while attempting to make his characters as unique as possible. Kishimoto cites Akira Toriyama’s Dragon Ball series as one of his influences, noting that Goku, the protagonist, was a key factor when creating Naruto Uzumaki due to his energetic and mischievous personality. When redesigning three characters for the series, Kishimoto cites The Matrix, one of his favourite movies, as an inspiration for their outfits. He has also cited Yoshihiro Togashi as one of his favourite manga authors, while the manga Sasuke by Sanpei Shirato, a series which Kishimoto likes, inspired Kishimoto in the development of the character Sasuke Uchiha. During the series’ publication, Kishimoto got married and had children. The changes to his personal life affected the story as he made the protagonist Naruto Uzumaki meet his parents, something the author wanted the character to feel based on his own experience as a father. When drawing the characters, Kishimoto consistently follows a five-step process: concept and rough sketch, draughting, inking, shading, and colouring. These steps are followed when he is drawing the manga and making the colour illustrations that commonly adorn the cover of tankōbon, the cover of Weekly Shōnen Jump, or other media. The toolkit he uses occasionally changes. For instance, he used an airbrush for one illustration for a Weekly Shōnen Jump cover but decided not to use it for future drawings largely due to the cleanup required.